The 2019 Honda Ridgeline is pickup truck that is enjoying growing success. While some may feel it is a unique offering, people are taking notice and making buying decisions, which is the second generation, and it looks to be an excellent choice to carry light loads around any household. The 2019 Honda Ridgeline will arrive with some unique features and driving capabilities. The Honda Ridgeline gets the job done. It is an excellent choice for anyone willing to depart from the crowd in preference for non-traditional body frame. Its body looks more like that of a car. Its suspension is also fully-independent. Riders can experience a feeling of more exceptional comfort and handling. The most impressive thing about the Honda brand is its overall reliability for every trim model. Honda continues to outpace all brands with several models topping the top-ten most reliable cars list. Honda also maintains a host of car dealerships and mechanic shops that are Honda-qualified. What Are Some New Features For The 2019 Honda Ridgeline? There are a handful of Ridgeline trims from which to choose. These include the RT, Sport, RTL, RTL-T, and RTL-E. Each trim arrives with the careful and deliberate engineering with which Honda manufactures every trim. Consumers can choose the front-wheel drive, LED taillights, 18-inch alloy wheels, infotainment touchscreen, blind spot monitoring, leather-trimmed interiors, and much more depending on their choice and lifestyle. The Ridgeline offers one of the most robust trim lineups on the market. How Powerful is The 2019 Honda Ridgeline Engine? All trim models enable 286 horsepower, V6, 3.5-liter of engine power, and a six-speed automatic transmission w/OD. 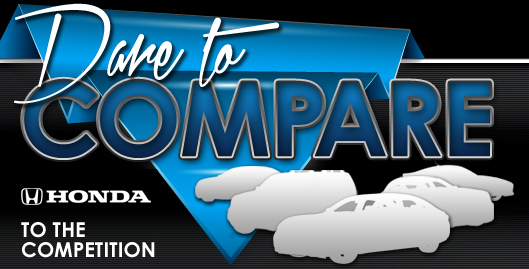 Gas mileage remains virtually the same for all trim levels. Drivers can count on plenty of power to pull those light trailers and light loads. It is easy to see why the 2019 Ridgeline has all the power you will need for any adventure. 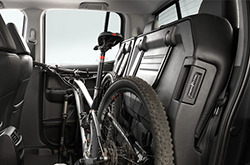 Do The 2019 Honda Ridgeline Have Impressive Safety Features? Honda vehicles utilize both passive and active safety measures. Active safety technology is always at work protecting passengers and drivers so they can keep their mind and eyes on the road ahead. Passive safety technologies are those systems that drivers hope they will never need. Across all trim models, active safety systems include, but are not limited to, vehicle stability assist, anti-lock braking systems, electronic brake distribution, braking assist, distributed airbags, and an anti-intrusion system. 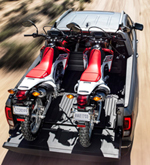 The 2019 Honda Ridgeline is a smart looking utility vehicle that can tow up to 5000 with its front-wheel-drive trim. Owners can also comfortably fit sheets of 4' by 8' plywood. 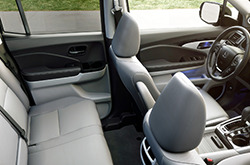 There is plenty of room in its spacious interior for cargo or passenger configurations. The Ridgeline is making its mark. The best way to experience the Ridgeline is up close and personal. Plan a visit to your dealership for a test drive. Honda customer service personnel are more than happy to answer any questions.